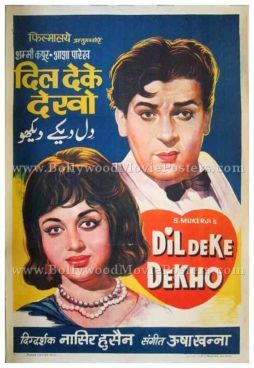 Old Bollywood movie poster of the hit Hindi film, Dil Deke Dekho (1959) for sale. This is an actual surviving original vintage Bollywood movie poster of the 1959 Hindi film directed by Nasir Hussain that starred Shammi Kapoor and Asha Parekh in lead roles. Dil Deke Dekho was Asha Parekh’s first film as lead actress. She had earlier played roles mainly as a child actress, making this poster highly collectible. Printed and circulated a few years after the first release run of the film (1960s), this old hand painted Bollywood movie poster was originally designed for publicity of the film but never ended up being used. This vintage Bollywood movie poster features stunning hand painted artwork. Originally hand painted on canvas by a Bollywood poster art studio in Delhi, the poster has a very retro and vintage appearance. Lead couple Shammi Kapoor and Asha Parekh are seen in beautifully hand painted portraits in this vintage Bollywood poster. The logo of the film appears encased inside a heart at the bottom. 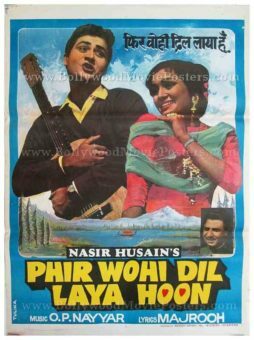 Old vintage Bollywood movie poster of the hit Hindi film Phir Wohi Dil Laya Hoon (1963) for sale. This is an actual poster of the 1963 romantic film written, produced and directed by Nasir Hussain. Printed and circulated several years after the first release of the film (somewhere in the 1990s), this movie poster was originally designed for publicity of the re-release of the film but never ended up being used. This poster was originally designed by cutting out images of actors from separate still photographs (shot on set location) and pasting them on a board. The background as well as typography are hand drawn / hand painted, which makes this poster an interesting mix of two very different design techniques. In the poster, Joy Mukherjee is seen holding a guitar with Asha Parekh by his side in a dancing pose. The villain of the film, Pran is represented on the poster by a lazy passport styled photo pasted on the bottom. The typography of the poster is entirely in English, except for a translation of the title into Devanagari Hindi. Phir Wohi Dil Laya Hoon (I'm Back With the Same Heart) is a 1963 hit Hindi film produced and directed by Nasir Hussain. The film starred Joy Mukherjee and Asha Parekh in lead roles. Pran played the villain in the film. The film included many superhit songs like “Dekho Bijli Dole Bin Badal Ki” sung by Asha Bhosle and Usha Mangeshkar, “Mujhe Pyar Mein” sung by Asha Bhosle, “Lakhon Hain Nigaah Mein” and “Banda Parwar” both sung by Mohammed Rafi. 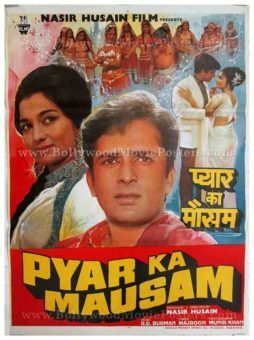 Old Bollywood movie poster of the popular Hindi film, Pyar Ka Mausam (1969) for sale. This is an actual poster of the 1969 romantic film written, produced and directed by Nasir Hussain. In the poster, the lead couple is seen in a romantic pose, accentuated by stars and sparkles in the dreamy background. The typography of the poster is entirely in English, except for a translation of the title into Devanagari Hindi. Pyar Ka Mausam (Season of Love) is a 1969 romantic Hindi film starring Shashi Kapoor and Asha Parekh in lead roles. It also starred Bharat Bhushan, Nirupa Roy and Madan Puri. It is one of the only two films in which one of the greatest Bollywood music directors of all time, Rahul Dev Burman played a role in (in addition to composing music for the film), the other being Bhoot Bungla. The theme song (Tum bin jaoon kahan) is one of the only songs in Bollywood sung by both leading singers Mohammed Rafi as well as Kishore Kumar in the same film.